Hello crafters! Welcome on another Funday Friday Challenge! This week, I am hosting the challenge. We have a lot of sponsors this week. 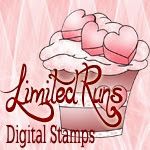 One lucky winner will receive 5 stamps of their choice!! I chose to use the faux tile technique of my card. I learned this technique about a year ago. I think that this card is fantastic. Hope that you have a winderful Friday and weekend. I love your cards! Following you blog now :D Have a nice day!